I'm a sometime writing teacher and I'd love to enter the contest to win a copy of the book that generated the very positive review, above! Hello! 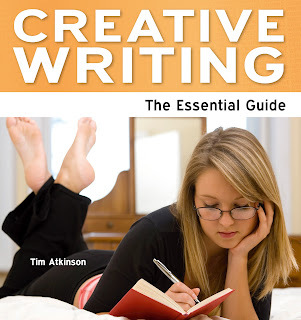 I'm writing my creative writing thesis now and this book would really be of help. I definitely could use this book, as I am in some serious need of being fired up. I write intermittently, and I want to create the habit of writing every day. I want to be a writer who writes! Thanks for the opportunity! Working on my first poetry collection and would clutch this book to my heart with super glue. I have so many books on creative writing. It's nice to read different ideas and perspectives on the subject. To me, one of the most vital ways to gain strength as a writer is to research using the tools of the trade. Besides being signed up with very helpful writer's forums, I am slowly amassing a small but concise reference library. This book would be a great addition and an invaluable resource for my freelance writing business. Sounds like a great resource for writers. Count me in, I'd love to win a copy! Sounds like someone has finally come up with the book that can serve as the basic "go-to" handbook for creative writing. Count me in! With such a positive review, how can an aspiring author resist entering in a chance to win this book. Fingers crossed! I've been twice lucky after commenting on book blogs. This one would definitely be a useful addition to my writing library. Maybe I'll be three times lucky, I'd be happy! So many writing books, so little time. What makes it worse, it is so hard to know which one to choose out of the bunch, but with a review like that, I'll comment for the chance to give this book a try. I'd love to be in that top ten percent. Please enter me in this contest. The review convinced me to enter. Thanks! This sounds like a terrific book that I would love to have. Thanks for the review. Sounds like a great book to add to my writing collective... especially now I'm trying to get back into writing! Thank you for this opportunity. :) Great article! A book I need and digital is the way I'd go. Thanks! This sounds like a book that any writer could use, but especially someone like me, who is just starting out. I'm way overdue for a good creative writing book. Time for a creative kick in the pants (if I win, that is!). I'm always intrested in learning new techniques, whether writing itself or promotional, etc. I'd love to win a copy of this book. I went to Amazon to see about ordering this book and it is out of stock, I'm never lucky at winning things so I thought I would just go ahead a purchase. Since I can't do that I guess I will take a chance and see what happens. Oh me, me ME!!! Please pick me!! Kathryn ~ You can purchase it directly from the publisher, Need2Know. They are based in the UK, but I checked and they do have international shipping. They also have a package where you buy the print book and get the e-book for free (and for immediate download) or you can just purchase the e-book by itself for 3.99 pounds, which is roughly $6.43. I'm working on getting my writing groove back, and I can use all the help I can get. Thanks for the opportunity! I have just published my first book. It is more of a memoir about my breast cancer experience. I love writing and have a few ideas for creative writing, but I am unsure how to get the best start. Going back to school to take creative writing is not in the cards for a few more years, I would LOVE to win a copy of this. This book sounds awesome! I hope I win one. I've been trained in everything under the sun in everything /except/ creative writing, which I hope to do for a living. This book seems interesting. I CAN LEARN FROM THIS BOOK. I always get stuck in the middle of my story. Hoping this book will help. This would be a great source book! This sounds like it would be so helpful. I love writing and maybe this would help me to do more. I would love to win this book! I have been trying to get a traditional book deal and could use any help I can get! i would love to read this book i need more help with my creativity. I would definitely love to win a copy of this book. Thanks for the giveaway. I would love to win this. I would expand in a very impressive way, but I need to read this book before I am able to do that successfully. Oooo, one of my favorite subjects. Thanks! It sounds good. I would like it. Happy weekend! Thank you for all your comments! It's great to see all the interest in creative writing. We held a random drawing via random.org and it picked comment number 8 ~ Betsy! Congratulations, Betsy, you won a copy of Creative Writing: the Essential Guide. I didn't see any info on your profile, so please email us at editors@wow-womenonwriting.com with your name and mailing address. You mentioned having some mental blocks. Hopefully this book will get those cogs turning!